This Christmas be Nautical & Nice to the Boater on Your List! Sail Georgian Bay offers a variety of courses to suit different age groups and skill levels. At Sail Georgian Bay, students learn to sail in our fleet of Mango Escapes, Picos, Club 420’s and high performance Laser Vagos. This year the club has also added a Minuet keelboat for adult lessons. Sail Georgian Bay will be held at Meaford Harbour, running all summer. 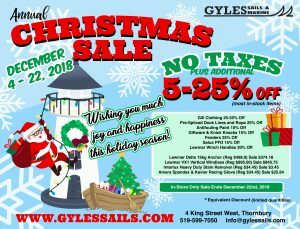 Visit Sail Georgian Bay or contact them at 226-668-2944. The Town of Collingwood has assumed the operations of the Collingwood Sailing School starting in 2015 and is excited to continue the program. The summer program will continue to run the CANSail 1-4 curriculum as well as evening adult lessons. The school uses Optimst, Club 420, and Laser dinghies. Do you have an upcoming marine event?